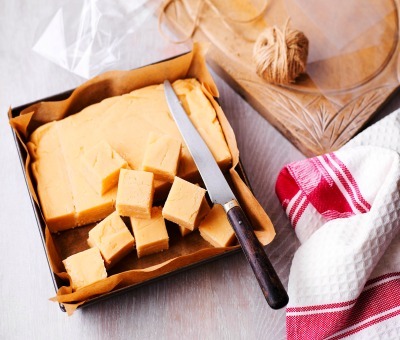 Using only 5 ingredients this delicious Peanut Butter Fudge recipe is great for sharing. In 4 simple steps you can make 36 scrumptious squares, allowing you to make a delicious homemade gift! 1. Place the condensed milk, peanut butter, vanilla extract and butter in a non-stick saucepan. Melt the ingredients gently over a low-medium heat, stirring occasionally until smooth and silky. 2. Turn the heat up and bring the fudge to the boil for 2 minutes – stirring all the time to prevent it sticking to the pan. The mixture should thicken and start to come away from the sides of the pan. 3. Remove from the heat and sieve in the icing sugar and mix thoroughly (you can use an electric whisk if you like). Pour the fudge into the tin and smooth over the top with the back of a spoon. 4. Chill in the fridge for at least 1 hour or until set, then cut it into squares. Store in an airtight container in the fridge for up to two weeks. Recipe contains milk and nuts.